Good Morning! The Red Bulls are back in action today, @The Cathedral of Football, against the very hot Colorado Rapids. The confident Rapids are have won their last two games 3-0 and are looking to get a grasp on a playoff spot. The Red Bulls will be looking to bounce right back from that lackluster perfomance @Rio Tinto last weekend and will have the four players that were missing, due to International commitments, back in the fold. In 2008 and 2009, when the Rapids visited Giants Stadium, it's been "Conor Casey Day". 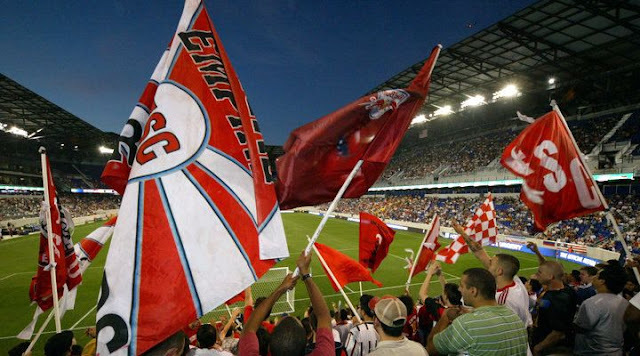 The Red Bulls will be looking to put a stop to that @Red Bull Arena. Also, this, the only home match in September, comes before a two game Western Conference swing. These three home points are vital to keep the Eastern Conference pack at bay. With all that in mind, let's get to some predictions. Colorado has scored three goals in successive matches and Omar Cummings looked like a man possessed last weekend, with two quality strikes. Meanwhile the Red Bulls failed to put their chances away against RSL and were lucky not concede more. This was a game I had down as a sure 3 points a few weeks back, but now I’m not so sure. Colorado has everything to play for, with the playoffs still a real possibility, while we are pretty certain of locking down second in the miserable Eastern Conference. Conor Casey always seems to get a goal against us and I could see Cummings abusing Roy Miller for his poor positioning. I’ll go for a 2-2 draw. Tchani and Angel for the Red Bulls, while Cummings and Casey strike for the visitors and get a draw late. I'm going to be a bit more optomistic than Matt and say that the Red Bulls will come out of this one victorious. With two away matches after this one, against Western Conference teams (Dallas and Los Angeles), it's vital that the Red Bulls take all three points on offer from this one. Mr. Backe has given the order of victory at any cost, so there will be an urgency amongst the big guns (JPA, TH14 & RM4) to get this done. I say Red Bulls 3, Colorado 1. Quick pick from vacation. Although Colorado has been strong of late, the Red Bulls are a completely different team from what we saw last week, when we have our full starting XI. I like Red Bulls at home, 2-1. Henry and Tchani. Well since I assisted in the training session in Montclair on Thursday ( I tossed a ball that went out of play to Andrew Boyens during the scrimmage) I think the Red Bulls are in good shape to bounce back from that disaster in Utah. I am predicting 3-1 (to the Red Bulls). Dutch Midfield Maestro Clarence Seedorf has been linked with a transfer to the Red Bulls. He would be a Designated Player, of course, and it could happen, as Juan Pablo's future with RBNY seems to be in doubt after this season. It seems that Thierry Henry AND Rafa Marquez are now taking the PATH to work and back. The Red Bulls will be hosting a Food Drive before the game today. Oh, and $1 hot dogs are back @half-time. A moment of silence will be held before the National Anthem, as the victims of the September 11th attacks are remembered. That's it for now. Look for our drunken comments in the next day, or two. I hope to see you at the game. Viper out!